Michael Tilson Thomas and the San Francisco Symphony release live recordings from their memorable 2012 American Mavericks festival, featuring seminal works by Henry Cowell, Lou Harrison and Edgard Varèse, in HighResAudio. 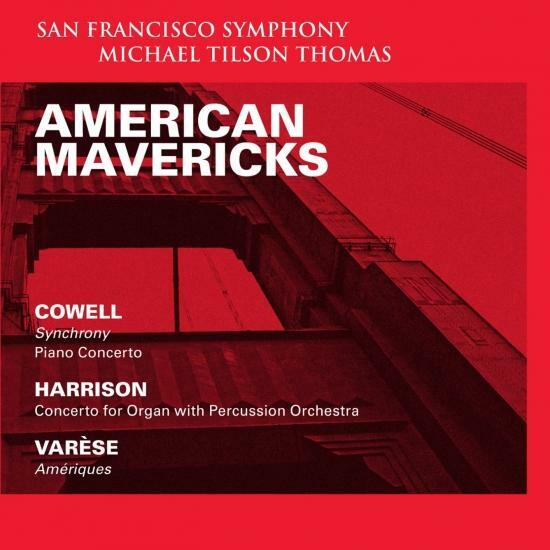 The latest release from Michael Tilson Thomas and the Grammy® Award-winning San Francisco Symphony features stunning live recordings from their wildly successful American Mavericks festival, a slate of concerts and special events focusing on the compositional voices who created a new American sound for the 20th century and beyond. Following two weeks of concerts in March 2012 in San Francisco, MTT and SFS took to the road to present these concerts throughout the US, attracting international attention. Presented in 96kHz, 24bit, the recording captures performances of four works by three influential but seldom heard 20th century masters. Henry Cowell's Synchrony and his Piano Concerto, with Jeremy Denk, combine Cowell's distinctive musical language with exceptionally expressive playing. Lou Harrison's eclectic compositional style and organ soloist Paul Jacobs’ spectacular virtuosity are on full display in the Concerto for Organ with Percussion Orchestra. This unique recording concludes with Edgard Varèse's monumental Amériques and the orchestral siren that influenced generations of composers.